I did a blitzkrieg trip to Munich for the first ever DITA-OT Day. It was a complete blast for me, and here is a report. First, “DITA-OT” is the DITA Open Toolkit, an open source tool for processing DITA XML source files and outputting them to various formats like PDF, HTML, webhelp, Eclipse help, etc. It’s highly configurable and customizable and is used by many DITA vendors, and by many companies and individuals in one form or another. It’s something I work with all the time in my client engagements. There have been many presentations involving the DITA OT at other conferences, but there has not been a day-long conference devoted to it. The DITA-OT Day was a free event organized by the creative and super-productive George Bina of Syncro Soft (makers of the Oxygen XML editor) with the help of several other people. Sponsors were Oxygen, Ixiasoft, DITAworks and Gnostyx. For a documentation tools geek, XML programmer and irrational DITA enthusiast like me, the DITA-OT Day was kind of the equivalent of a moon landing: I got to travel to a very far place and listen to and interact with the most important inhabitants of planet DITA-OT. It was held at the Holiday Inn in central Munich, right after the end of the CIDM DITA Europe Conference that was held in the same hotel. So the DITA-OT Day was piggybacking. You might ask why a whole day would be devoted to the DITA Open Toolkit. It’s just a DITA output tool, one of many ways you might go. But it’s dominant in the DITA community, with many people using it. And although it has no official connection to the OASIS DITA specification, the DITA OT tends to be the most up-to-date and comprehensive DITA processor available. It’s not a simple matter to do all the processing necessary to conform to the DITA spec. Without the DITA OT, I believe that DITA would not be nearly as widespread. The OT has many warts, and some people really dislike it, but it is a pillar of the DITA community that we could not easily replace. It makes sense that a tool this important would come into its own a little more. I estimate that over half of the attendees were programmers, so this promised to be a pretty geeky event. Details of the history of the OT (Kristen Eberlein covered some of this). The range of OT customizations you can do, arranged from from simplest to hardest (Robert Anderson of IBM, main OT wrangler). 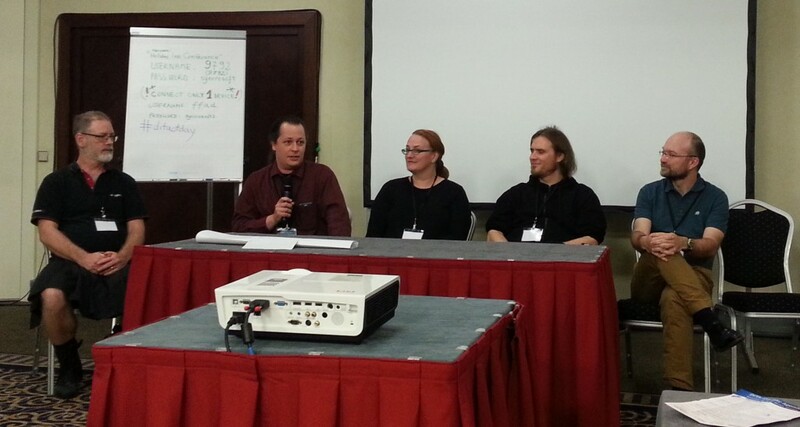 A panel discussion on the present and future of the DITA OT. The greatest thing for me was getting a deep dive into DITA OT internals, presented by the person doing most of the OT coding these days: Jarno Elovirta. It was also great to hear him pronouce his last name in person. He said all those syllables so fast! Hearing Jarno’s descriptions of various parts of the OT, things he hates, things he wants to change and so on, was very gratifying for me. During the event the release of DITA Open Toolkit version 2.0 was announced. Also, I had expected to pay for my own lunch, but attendees were treated to a very nice lunch at the hotel restaurant. This was not advertised! The day was a big success with more people attending than expected. 91 people attended in person, and I hear there were as many as 80 more watching the stream online. There will be recordings of the talks, split into segments, but they are not ready yet. Check the Oxygen website or follow George Bina on Twitter: @georgebina. The OT needs more volunteers to do documentation, programming, and give support in various ways. If you are interested, talk to Robert Anderson of IBM at his site: http://metadita.org/. Or @robander.